Ben Roethlisberger has had an interesting couple of seasons. After tinkering with the idea of retirement in the press on multiple occasions last season, the star quarterback seems to have changed his tune. Now that he has recently stated that he wants to play another three to five more years, what does this mean for the Steelers as a whole? Big Ben's new commitment to the team comes just a few months after the team came within one game of reaching another AFC Championship Game. 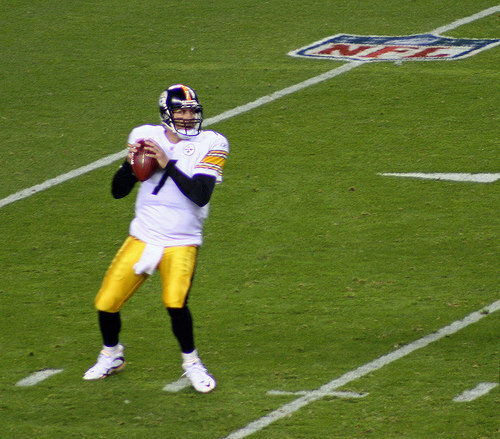 Roethlisberger was great for most of the team's high-scoring playoff loss to the Jacksonville Jaguars. However, he had some costly turnovers that resulted in the team needing to make up too big a deficit in the end. Some are raising their eyebrows about the timing of Roethlisberger's decision to recommit himself to the Steelers in the long term. Pittsburgh just drafted another quarterback, Mason Rudolph out of Oklahoma State. Rudolph was a prolific passer in college and is thought to be the successor to Big Ben once his career comes to an end. With it looking like the Landry Jones experiment as a backup is coming to an end, some think that Roethlisberger has announced his commitment to the team to prevent any succession from taking place. With Roethlisberger, Antonio Brown, and Le'Veon Bell all coming back to the Steelers next season, the team should be prohibitive favorites to get to the playoffs as AFC North champions once again. Given the problems with the Browns, Ravens, and Bengals, the only question at this point will be just how heavy a favorite Pittsburgh is to win the division when the season kicks off. Fans should give it some thought before betting on Pittsburgh in their first game of the season against the Cleveland Browns. While the Browns went winless last season, they went 1-1 against the spread against the Steelers last year thanks to a close game in the first week of the 2017 campaign. While fans looking to use NFL betting offers search for a team to apply them to, it is at least worth remembering that Browns vs. Steelers isn't always the mismatch it appears to be on paper. While the Steelers will be favored to win the AFC North, Ben Roethlisberger's future will have a lot to do with the fate of his offensive line. In his comments about sticking around for several years, the star QB mentioned that it's hinging on whether or not his linemen stay together as a unit. Offensive line health is so important to the health of a quarterback, so this makes a lot of sense. However, with free agency and other roster moves aimed at cutting costs, it may be difficult for Big Ben to get what he wants in that regard. No matter what ends up happening with the future of Ben Roethlisberger, the immediate future of the Steelers looks bright. As long as the team can improve defensively, they should have a great chance to make the AFC Championship Game once again.